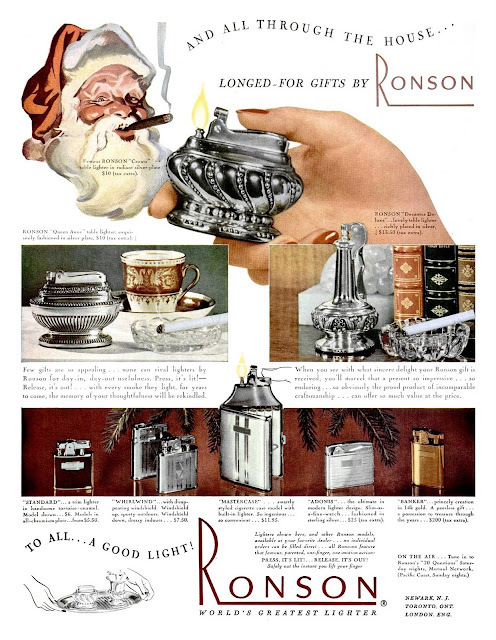 The Ronson magazine advertisements from LIFE published on 1 December 1941 depicts among others the best sold table lighter ever - the Ronson Crown - this cigarette lighter was manufactured almost unchanged for more than 18 years! Other table lighters were not yet described on this blog: both are Ronson Touch-Tips: Touch-Tip with Cigarette Box and the uncommon Touch-Tip Oval. The Benlow "Golmet" Table Lighter was manufactured in ca. 1940 in England by the Benlow Company which was established in 1933 by Benno Löwenthal. Benno was the brother of Julius Löwenthal - the co-founder of Colibri (England) and Ibelo (Germany). pocket lighters - Ronson Standard, Whirlwind, Mastercase, Adonis and Banker. The Flaminaire Baronet is classic of gas lighters. It was made in 1948 by Quercia in Paris, France. The production of this model ceased in 1956. 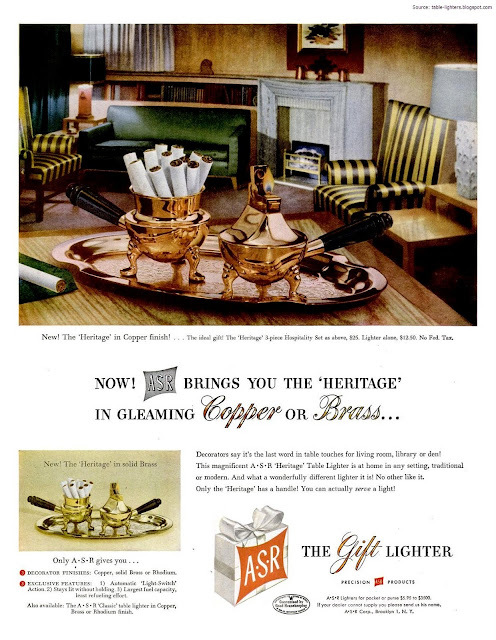 The Flaminaire lighters were one of the first lighters that used a disposable butane tank. It was a strong brand in France and Canada owing to its innovative attitude and various designs and patterns of the table lighters. The Flaminaire Baronet was available in up to twenty different finishes. The version depicted on the right is covered in brown leather. 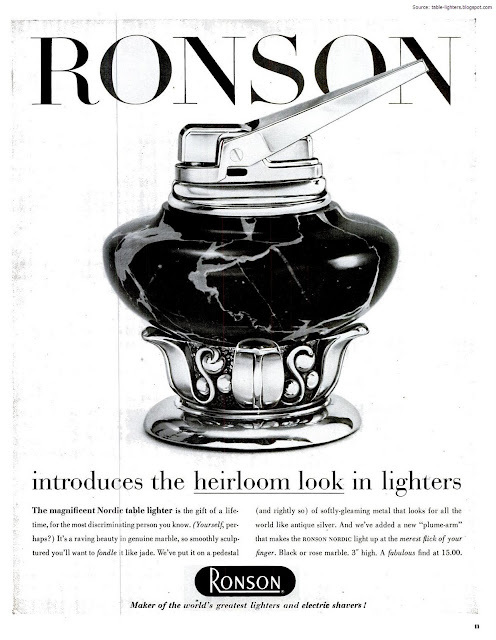 A full-page magazine advertisement devoted in all the nifty Ronson Nordic Table Lighter made of black marble. Published in LIFE 21 May 1956. Great magazine advertisement published in LIFE, 5 July 1950. It depicts the The Heritage Set made by A·S·R· Corp (Ascot). Great magazine advertisement published in LIFE, 2 May 1955. 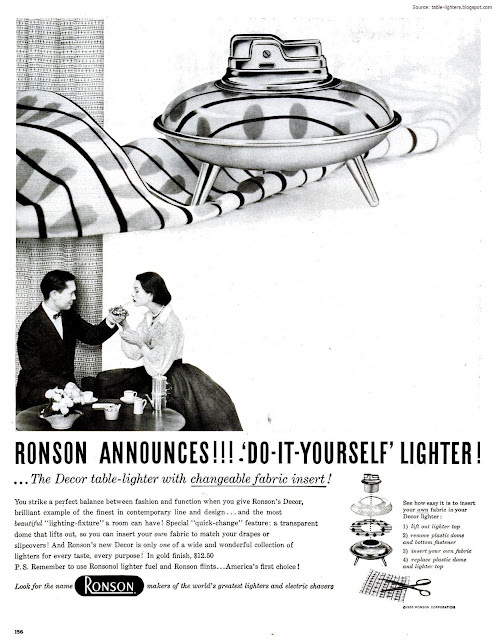 It depicts the Ronson Decor wick table lighter. The S.T. Dupont Diamond Head Table Lighter model (catalogue no. 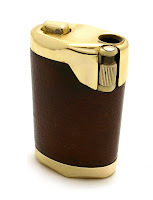 27211) is a modern example of a luxury gas cigarette lighter made in France. It was marketed since 1995 around the world and discontinued in 1999. It had a three year guarantee and was something between a pocket lighter and table lighter. The lighter is heavily electroplated in 18 karat gold and was also available in silver plate finish. Both had the iconic Diamond Head pattern. Not many of them were actualy manufactured and sold which might be explained taking into account the very high price. The quality of this lighter is high though it does not fully justify the price which was above $1250. The construction as well the size does remind on the 1975 S.T. Dupont "Line I" model which was available also in gold plate and additionally in tortoise enamel. The Rosenthal Marktredwitz Table Lighter was made in the second half of the 1940s, perhaps in the year 1946 by Rosenthal Porzellan AG in Marktredwitz, Germany (U.S. occupied zone). Previously the fabric was called "Porzellanfabrik Thomas & Ens" and was founded in 1904 by Fritz Thomas. But only five years later, the porcelain factory, by then called "F. Thomas, Marktredwitz", was acquired by Rosenthal and since then it was a Rosenthal's Division. The table lighter has an electric filament (manufacturer unknown) and a push-button mechanism. When the button on the left is pushed the coiled element on the top glows. It was only made in the 110/220 volt version they were used at home and in public places. They were connected to the electrical source via cable. 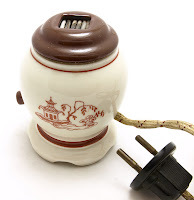 The body of the electrical lighter is made of Rosethal's porcelain lacquered in brown and white. On the front one can see an oriental picture. This Consul Arlac table lighter was made in 1963 by Gebrüder Köllisch A.G. The company was situated in Nürnberg, West Germany. The first Consul table lighter was introduced in 1952 and the company prospered well till 1971/1972 when it was acquired by the giant Braun. The Arlac model is a butane gas and flint lighter. It has its flame control switch on the top. 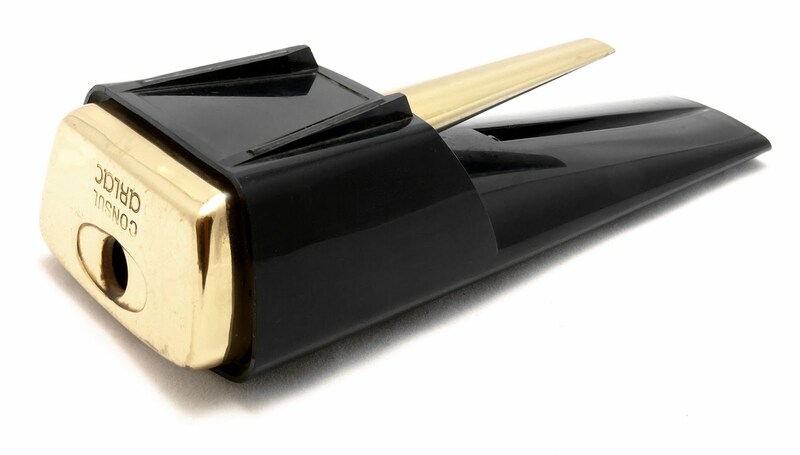 The cover is made of black plastic and the rest is made of brass with gold plating. A nice decorative table lighter. Please notice that in the picture above the lighter lies on its beg. Marked on the face: Arlac Consul. What is interesting almost the same design was applied for a Brown and Bigelow Lighter which was marked Remembrance. The size was exactly the same as in Consul Arlac.